I loved this dish, but blog contributor 'the grandcruman' was not a fan since this had a strong vinegar-Dijon mustard flavor. So note: you must like that flavor profile in order to like this dish. This dish does not lack flavor for sure! In short, this is a haricots verts (or green bean) dish with crispy potatoes on top and a shallot/Champagne vinegar/Dijon mustard with parsley vinaigrette. Used green beans instead of haricots verts. The potatoes stuck to the aluminum foil. We'd suggest slicing them thicker next time and not using aluminum foil on the baking sheet. This makes a lot of dressing. 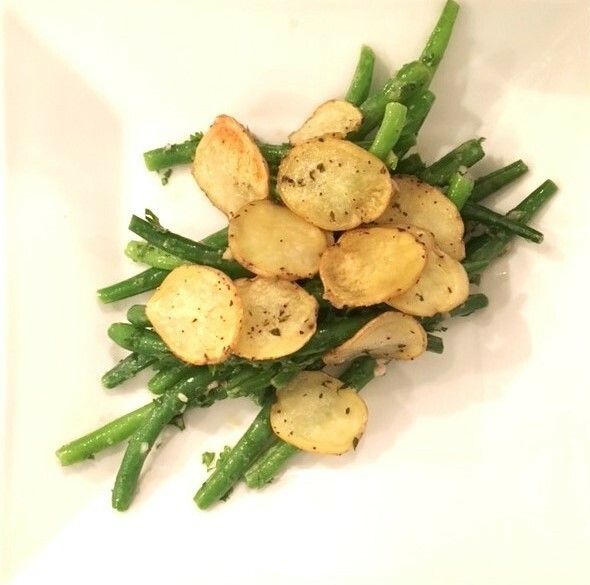 For 2 lbs of haricots verts, make just 3/4 or less of the dressing.